IQS Directory is a top industrial directory listing of leading industrial retractable hose reel manufacturers and suppliers. Access our comprehensive index to review and source retractable hose reel manufacturers with preview ads and detailed product descriptions. These retractable hose reel companies can design, engineer and manufacture retractable hose reels to your specifications and application need. A quick and easy to use request for quote form is provided for you to contact these retractable hose reel manufacturers and suppliers. Each company has detailed profile information, locations, phone number, website links, product videos and product information defined. Read customer reviews and product specific news articles. We are the right resource for your information requirement whether its for a manufacturer of self retracting hose reels, retractable cable reels, retractable medical oxygen hose reels. We are proud to be one of the world leaders when it comes to product innovation and quality service. Our retractable hose reels incorporate the most current design and manufacturing techniques to guarantee lifelong satisfaction and trouble free performance. Our engineered products are better by design. Visit our website for more information, send us an email with your questions and concerns or call today! Our staff members are standing by in order to help answer any questions. Have you been looking for retractable hose reels? Look no further! We are family owned and pride ourselves by treating our clients as if they were family members too. We aim to be the preferred provider of only the highest quality custom components for motion applications. Our company has been upholding our values since 1952 when our doors opened, with customer service being our number one priority. Our website is a great source for information if you have any questions or call today! Constructed with quality materials for years of durability and minimal service, our retractable hose reels have a heavy-duty spring motor, non-sparking ratchet, durable frame construction and declutching arbor to prevent damage from reverse winding. There are a variety of roller positions available for easy installation anywhere. Visit our website for more information. We are a global, diversified manufacturing company that makes high quality retractable reels. We are dedicated to bringing uncompromised honesty and integrity to everything we say and do! Our retractable reels are used in a variety of industries around the world! We offer both standard and custom reels as well as replacement parts! Trust Unique Hosereels for all your hose reel needs! Call us today! Retractable hose reels are a specific type of hose reel, which are drum-shaped devices used to wind, unwind and store hose. Also known as automatic hose reels, retractable hose reels are those hose reels that engage in automatic retraction, rather than manual retraction. Retractable hose reels are superior to manual hose reels, which come equipped with hand-operated cranks, in a number of ways. They move faster, fatigue slower and are overall much more productive. In addition, these efficient hose reels are much less taxing, as the labor of a human operator is not required to make them work. They may be made to meet any number of unique application requirements, both industrial and individual. They are, for example, available in smaller models to hold garden hoses and other, lighter hoses with smaller diameters. Other areas in which they are used include: health and safety, construction, agriculture, automotive and transportation, manufacturing and storage. Some retractable hose reels are made to fit very specific applications. For example, some reels are fabricated and used only for transportation purposes, while others exist solely for transportation and storage uses. 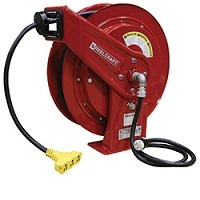 Still others, called live connection hose reels, are made to allow operators to use a hose even when it is wound up on the reel. Retractable hose reels designed for use with construction hoses and fire hose applications generally have more rigidity and a larger build, in order to support the extra length and load of their application. Retractable hose reels are subject to many design options. For example, they can retract hose using the power of a few different possible methods. Manufacturers may help hose reels harness their power through the equipment of air or pneumatic motors, electric motors, hydraulic motors or elastic devices known as internal springs. Additionally, if the application calls for it, a spring-powered hose reel may be hermetically sealed, an act that completely isolates it from moisture and dirt. Also, many, if not most, retractable hose reels are accompanied by a latching mechanism, the job of which is to ensure easy hose retraction at any length and positive extension stop. Another design option of retractable hose reels is the material used to construct them. Common materials used to fabricate retractable hose reels include aluminum, stainless steel and various grades of steel. The choice of material may be based on very specific or very broad specifications. For instance, medical applications, food processing and pharmaceutical industries require that all hose reels are made from a sanitary grade material like 304L stainless steel. Meanwhile, many applications within construction and industrial manufacturing simply necessitate that the hose reels be made of a corrosion resistant and heavy duty metal. In addition to live connection configurations, which were mentioned in the second paragraph, retractable hose reels may be fabricated to fit four basic configurations: portable, reel and assembly, collapsible and storage reel. Portable hose reels are constructed with an attached handle so that they can be moved from one place to another by hand. Reel and cable assembly hose reels consist of a variety of feature combinations. While they may contain any number of optional items, all such hose reels contain a wire and a reel. Collapsible reels can be broken down or folded flat to fit into small spaces or take up less room when not in use. Finally, storage reels are made simply for storage; they are not made to move and they do not work unless the hose is unwound. Similar to retractable hose reels are retractable cable reels and retractable cord reels. These reels also provide winding and storage via motor-driven, spring-driven and hand crank-driven configurations. However, they simply provide these services for various types of cables and cords. In addition, just like retractable hose reels, they are subject to the five basic reel configurations: live connection, portable, reel and assembly, collapsible and storage reel. Interested parties may seek retractable hose reels that have certain warranties or meet certain government or industry standards. Examples include no leak/no break/no rust warranties, limited warranties against product failure, factory guarantees and limited warranties against workmanship and material defects. Attainable standards include: ISO 4642-1:2009 (standards for semi-rigid reel hoses intended for fire-fighting), ISO 1402:2009 (hydrostatic testing of hose assemblies), ISO 4671:2007 (measurement of the length of hose assemblies) and many more. For the success of an application, a healthy customer-manufacturer relationship is important. Therefore, retractable hose reel customers should not hesitate to ask manufacturers questions before making a decision, such as those related to their post-assembly maintenance and parts replacement options. 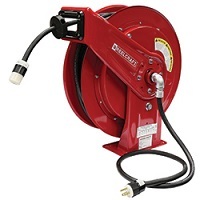 Retractable Hose Reel – Reelcraft Industries, Inc.